Self publishing a book with Kindle Direct Publishing (KDP) for the Amazon Kindle Store is free. It is the designing, styling, formatting and preparing your Word document that can be the tricky part. Many people prefer to pay someone else to do this for them, but if you have a solid working knowledge of Word and the time to do it, then you are able to do this yourself. I have successfully formatted several books for Kindle using the guide below. I created this guide from my own experience, notes and research. It is for those who are not familiar with html and other fancy coding techniques. I hope it helps! If reading all of this sends you into a state of panic, or you simply don’t have the time or know-how, then never fear. I am here to help! I offer all of these services. Feel free to email me to find out more. Did you know that MS Word is still one of the best software programs with which to create a Kindle book? Most writers don’t think about setting up a Word document correctly formatted for Kindle before beginning to write, so the completed book in Word will need to be formatted in order to display correctly on the Kindle. It is crucial that all editing has been completed on the manuscript before you begin to format. For this guide, I am using Microsoft Word 2007. If you are using another version of Word, you may need to find the menus in a different place. FIRSTLY MAKE SURE TO MAKE A COPY OF YOUR BOOK and always work on the copy document and NOT the original! Bear in mind that Kindle pages are fluid. Kindle devices have different size screens and readers could also be using computers, tablets, or smart phones to read your book. Font sizes can be adjusted by the reader. So with all this variability, most readers will not see your book as you have it on the screen in front of you. The number of words on a page and even letters in a line will look radically different to each reader. That is why it is so important to be certain that your document is formatted correctly to read well on any device. Keep it simple. Remove any headers, footers and page numbers. These do not work in Kindle. I then recommend removing ALL formatting from your document and starting from scratch. This might seem drastic, but it is the best way, in my opinion, to create a perfectly formatted Kindle-ready document. You can do this by selecting the entire document (CTRL-A) and pasting it into Notepad, then re-open a new word.doc and paste the unformatted document from Notepad. BE AWARE that by following this guide, you will lose all your manual formatting such as heading fonts, italics, bold, tables, and everything else. You will need to add these back into your document in the correct manner, one by one. Removing all formatting will not get rid of things such as extra spaces, extra paragraph returns, or tabs that you added into your document. These will need to be manually removed. Although this is a lot of work, it is my preferred method in order to create a perfectly formatted Word file for Kindle. You can use your original saved Word document as a reference to add your preferred formatting back in (you must use the style menu to add in any formatting, more on this below). At this point, you can also search for other errors by using the ‘find’ and ‘replace’ function. Some things to look out for are double spaces to be replaced with one space, or a space/period to be replaced with a period and so on. A correctly formatted Word document can be uploaded directly on Amazon’s KDP platform with near perfect results. In the long run, this can save a lot of trouble. 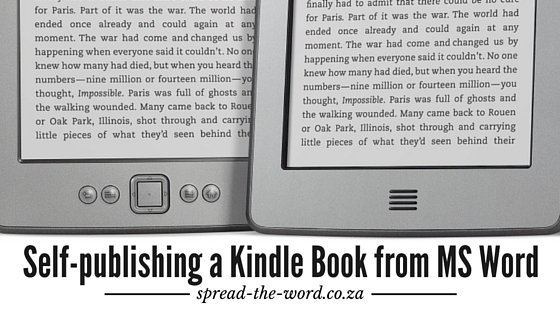 Now you are ready to begin formatting your book correctly for Kindle. DO NOT make any changes to the format manually in the document itself as you might usually do. You MUST format your document using the styles in the Word menu at the top of the screen in order to tell Kindle how you want it to display. If you create headings yourself by bolding text or changing the font size, you’ll end up with a mess on the Kindle. Select/highlight the entire document (CTRL-A) and change everything to ‘normal’ style to begin with by using the ‘styles’ box at the top on the HOME tab. Right click on the ‘normal’ style box and select modify to make any changes you would like to make to the way the text appears. Most Kindles use a default font for content so whichever font you choose will not translate. However, I believe that the Kindle Fire has a range of font options. These include – Arial, Caecilia, Courier, Georgia, Lucida, Times New Roman, Trebuchet and Verdana. If you’d like your fonts to display in a font other than default on the Kindle Fire, choose your font now. I recommend Trebuchet MS 10pt to simulate the Kindle look. Remember, Kindle books are re-flowable and can be viewed with different font sizes as chosen by the reader, so page numbers, font sizes and margins set in Word do not apply. Different text colors will also not show up on many devices. However the difference in size (normal vs titles/headings) will be visible. 10pt – 12pt is suitable for the body, and 14 to 18pt (largest) for titles and headings. Use single or 1.5 line spacing. 1.5 spacing will resemble the line spacing on a Kindle, although Kindle has a default line height, so it doesn’t matter if you prefer to use single line spacing. Don’t use the ‘exactly’ or ‘at least’ options. Make sure the AT field is blank. You can choose left justified or fully justified for all text (do this by modifying the ‘normal’ style), it doesn’t really matter as Kindle will justify everything automatically anyway. Centered text is acceptable for the Title and Copyright page, but make sure to do that using a new ‘style’. One of the most important styles is ‘Heading 1’, the style that you will apply to chapter titles. Using the styles menu, modify the ‘Heading 1’ settings that you wish to use for chapter headings. If you want your chapter headings to be centered, or bold, this is where you will change those settings. You can also set each chapter to start on its own new page. This will save time and eliminate problems caused when inserting manual page breaks between chapters. You can do this by going to Heading 1> Modify> Format> paragraph and under the [Line and Page Breaks] tab, check the ‘page break before’ box and save. Then highlight each chapter title individually and tag them as ‘Heading 1’. If you are using chapter subtitles, then set the subtitles as ‘Heading 2’, and so on. Obviously subtitles will not need to start on a new page. Modify the other ‘styles’ you wish to use in your document making a separate style for bold text, italic text, centered text, Book title, and so on. Use bold and italics as they will translate into your ebook. Remember to make all changes to formatting in your document from now on by highlighting the text you wish to change and clicking on the relevant style box at the top. The first line of every paragraph is automatically indented in Kindle. You can control how the Kindle indents the first line of your paragraphs by setting this in Word’s paragraph formatting under each style. If you don’t, the Kindle will indent the first line by a default amount. If you are using block paragraphs rather than indenting, the way around Kindle’s automatic indenting of paragraphs is to set the first-line indent in Word to .01 inches. The Kindle will indent the line by that amount—but to the reader, it will hardly be noticeable. Do this under your ‘normal’ style settings. Kindle will honor left paragraph indents, so you can use these for block quotes and such. You can’t have hanging indents, or first-line indents greater than 1.5 inches. Remove all section breaks. To create intentional page breaks, go to the PAGE LAYOUT tab (Breaks > Page). Your chapters will already start on new pages if you assigned them to do so under Heading 1, ‘page break before’ as discussed. There is no need to add any extra page breaks to chapters. Do not make more than 3 consecutive paragraph returns in a row, as this could result in a blank ebook page or poor formatting. Only add one paragraph return at the end of every paragraph. Now go ahead and recheck your formatting carefully on your entire document. It is a good idea to make the formatting marks visible during this next process. To show all formatting marks press CTRL-SHIFT-8 or click the ¶ button in the menu bar. You can turn these off at any time by clicking the button again. While checking your document, look out for any extra spaces (these show up as small dots) and any incorrectly placed paragraph breaks (these show up as the ¶ symbol). Both of these can cause problems during the Kindle conversion. Also check for non-breaking spaces, which show up as a hollow circle. It’s best to delete these. Page breaks show as dotted lines across the page, and should only appear where you have forced a new page. They won’t show up between chapters if you used ‘page break before’ on the Heading 1 style. TIP: To create an em dash instead of an en dash (a shorter dash used only to hyphenate words), press Press [Ctrl]+[Alt]+[-]. You must use the subtraction sign (-) on the numeric keypad. Front matter is the pages in the front of the book such as the Title Page, Copyright Page, Dedication, Introduction, Preface, or Prologue. The Title Page should be centered with the title on top and the author name underneath and then add a page break. A Copyright Page usually follows the Title Page. Use the word ‘copyright’ rather than the symbol which may not translate well. Insert a page break after the copyright details. Be sure to insert a page break after any other pages you use in the front matter unless you are using the ‘Heading 1’ style for the titles. Back matter is the pages at the end of your book which provide additional information for the reader, such as Appendices, Glossaries or an About the Author page. Insert page breaks after each section unless you are using the ‘Heading 1’ style for the titles. It is a great idea to add an ‘About the Author’ page with a bibliography as well as hyperlinks to your website, blog, and other social network sites. You could also leave a thank you note to the reader and a “Reviews Greatly Appreciated” reminder at the end of your book. To add images to your ebook, place the cursor where you’d like the image to appear, and go to Insert > Picture > then locate and select the file. Do not use the copy and paste function. Do not change the image size or formatting in the Word document, do that before you insert the image. Images should be inserted in JPEG format. Images are displayed in grayscale or color depending on the viewing device, so if you have color images, use those. Be sure to check that your images are displaying correctly in the preview stage. Note: manuscripts with images can cause your book to be larger for readers to download, which may end up costing you a portion of your earnings. UPDATE: With the introduction of newer, high-resolution devices, inserting images that show up as you want them to has become more complex. Always be sure to check how your images appear by using all the preview options available on Amazon KDP and make changes where necessary. It is highly recommended that your ebook has an active Table of Contents for easy navigation. Firstly check that all your chapter titles are present and formatted with the style ‘Heading 1’. If you are using subtitles, they should be formatted with the style, ‘Heading 2’ and so on. Word creates a Table of Contents based on the headings in your document. The Table of Contents is usually placed before the Introduction. Create a blank page for your Table of Contents, making sure there is a page break before the page. Give your table of contents page a title such as ‘Contents’. Place the cursor where you’d like your Table of Contents to appear (a line or two below the title) and make sure the style is set to ‘normal’. Under the REFERENCES tab, choose Table of Contents > Insert Table of Contents. A box will appear. Here, you will choose what appears and doesn’t appear in your Table of Contents. Leave ‘Formats’ as ‘From Template’. Decide which headings to include by selecting 1, 2 or 3 under ‘Show levels’. Selecting 1 will only show the headings formatted to the style ‘Heading 1’. If you want your subtitles to show up on your Table of Contents, selecting 2 will show headings formatted to the styles ‘Heading 1’ and ‘Heading 2’. I prefer to include only the chapter titles in the Table of Contents. Click OK. Check your Table of Contents to make sure that each chapter title is included. You can manually edit anything in the Table of Contents. I prefer to delete the title ‘CONTENTS’ from my TOC. You can check whether the links are working by using CTRL and clicking on one of the chapter titles. This should take you directly to that chapter. Don’t forget to continually save your document. Now you need to add guide items to tell Kindle where to find the Table of Contents and which page to open for the reader first. Place your cursor at the point where you want to place the guide. Under the INSERT tab, choose ‘Bookmark’. A box will open. Type in the name of the guide. Use ‘TOC’ for Table of Contents and ‘start’ for the place that you would like your book to open for readers. Some common choices are the Introduction, the Preface, the Title Page or even the first page of Chapter 1. It’s your choice. CONGRATULATIONS! You are almost ready to upload your book. The last step is to view and proofread your book before uploading for preview. I like to use this final step to check whether I am 100% happy with my formatting. To give get a rough idea of what the book will look like on a Kindle even before you preview it, you can simulate the average Kindle page size by changing your margin settings to 0.25 inches all around and customizing your page size to 4.1 by 6.7 inches (10.5 x17 cm). Make sure your line spacing is set to 1.5. This will allow you to see if any of your formatting is out and also to check for any final changes you might like to make. During this phase it is essential to use the formatting marks. Remember to make any changes in the styles menu and not manually as always! I go through every page in the document again carefully and then I look at the document in the ‘full screen reading’ layout under the VIEW tab to double check for any odd formatting or empty pages. Once you are satisfied with the formatting and layout of your ebook, you can now save your Word document ready for uploading directly to Amazon KDP. Remember that margins and page sizes don’t matter as they won’t translate into Kindle. KDP accepts most Word doc and docx files for ebook conversion; however, some files which contain complex formatting may not convert well, so check all formatting carefully by using the preview suggestions below before publishing. Your book cover image will be used inside your ebook, on your Amazon product page, and on various places on the web. A good cover image therefore needs to stand out and be striking as a thumbnail as well as at full size. The cover should be in color but should also look good in grayscale. Images should be either JPEG or TIFF files. For best quality, your image should be 1600 by 2560 pixels with 350dpi. Product images display on the Amazon website using RGB color mode. You add your cover by uploading a product image during the publishing phase which will then be automatically added to your book file during publishing. Do not include the cover image in the content of your book in Word as this could result in two cover images in your ebook. If you cannot design your own book cover, you can use the KDP Cover Creator to make one based on an image you provide or a selection from the gallery of stock images, customizable with a limited variety of different layouts and font sets. You can access the Cover Creator once you have added your title on Kindle Direct Publishing. This can be done during the preview or publishing stage. You are now ready to upload your book onto Kindle Direct Publishing and use the previewer to check your files to ensure conversion is successful. To do this, you’ll need a KDP account. You can use the same login details from your Amazon.com account. Previewing is an integral part of the process to ensure your readers will see the book you want them to see. Once you’ve uploaded your book there will be two preview options — the online previewer and the downloadable previewer. I recommend using both. The downloadable previewer allows you to view your book on a Kindle. If you don’t have a Kindle, you can download the free Kindle Reading app and preview it on your computer, tablet or smartphone. The online previewer, though helpful, takes ages to view each page individually. Also, images may not display accurately when you use the online previewer, but it is helpful to get a general idea of what your ebook will look like on different devices. Once you’re ready to begin, log in to your account and click the ‘Add new title’ button under the BOOKSHELF tab. Don’t worry, we are only creating a preview, and you will be saving your ebook as a draft for now so it won’t be published yet! Fill in all the details by reading the instructions carefully. Again, you’ll have a chance to change these before publishing. Enter your book details — book name, description, and contributors (author). You can choose to ignore the ‘optional’ choices. Choose ‘This is not a public domain work and I hold the necessary publishing rights’ if that is the case. Select two categories and fill in seven search words. Note: the categories are important as these will be the only categories where your book may appear on the bestseller lists. Upload or create your book cover. Note: your book cover may look pixilated on this page, but that doesn’t necessarily mean it will look like that on Amazon. Read what it says about DRM and select the option you want (once you publish your book, you cannot change its DRM setting). I usually enable digital rights management. You will now upload your book. Click the ‘Browse for book’ button and select your Word file and open. Then click ‘Upload book’. Be patient while your book uploads. Once you see ‘Upload and conversion successful!’ you will be able to preview your book. Under Downloadable Previewer select ‘Download Book Preview file’ and choose SAVE. This will be a .mobi file that you can read on a Kindle, Kindle for PC or Kindle Previewer. Now click ‘Save as Draft’ at the bottom of the page so that you don’t lose any of the information you filled in. You can now go to the folder where your downloads are saved and find the .mobi file of your book and either copy it to your Kindle or double click to view on Kindle for PC. Carefully search the ebook for any weird formatting. If you found any changes that need to be made during the preview phase, you will need to go back and make the changes on the master WORD document in the correct formatting manner. Once you have made the changes, re-save the master Word document. You can save over or delete the old files. Then you will sign into your KDP account and click on the book title under your ‘Bookshelf’. Upload the edited file on KDP and follow the steps to preview it again. Once you are happy with how your book looks on a Kindle, sign in to KDP and check all your book details and make sure you’ve read all information, before you go ahead with publishing. It’s a good idea to download a copy of your final .mobi file (download book preview file) for sending out to potential reviewers. You could save this in your ‘master copies’ folder. Then you can click ‘Save and Continue’. This will take you to a page where you confirm your publishing territories and choose your royalty option. Your book must be priced between $2.99 and $9.99 to choose the 70% royalty option. Remember that by choosing this option, you also pay a download fee at $0.15 per MB, so if you have a very large file, you need to take that into consideration when pricing your book. Once you have completed all necessary options, you are ready to click ‘Save and Publish’! Your book will appear for sale on the Kindle Store within approximately 12 hours. Within 48 hours, all other book features should be available on the detail page, such as the product description and look inside feature. Be aware that Amazon is constantly revising and upgrading, so some of these details may have changed by the time you read this. Check Amazon’s latest requirements here. You can now create an author page on Amazon. Head on over to authorcentral.amazon.com. Join with your Amazon account details (which will be the same as you KDP account). 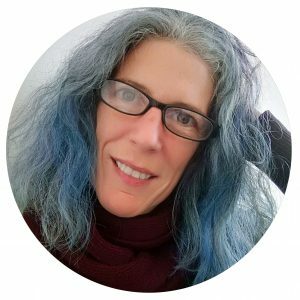 Here you can link your book to your author profile and add an author bio, photo and links to your blog, twitter, events and videos. Now you are ready to promote your book! Firstly, you will need some reviews. To find out how I went about getting reviews for my book, read my article Getting Reviews for your Book. After you get some reviews, it’s time to officially launch your ebook. Email your followers and connections letting them know about the release of your new book. Promote the book via online networks and social media. Give the book away. If you decided to enroll in KDP Select, you can offer your book for free for five days every three months. See my article Going Free with KDP. Again, if this all seems to much to bear, I can format your Kindle book from Word for a one-off fee. Books that include lots of tables and images are extra. This does not include book promotion which I charge for at an hourly or monthly rate. Feel free to email me to find out more. I enjoyed reading your blog. Is there any way I can use bullet points in my word formatted kdp book? Hi Karl, yes it is no problem to use bullet points in your word document for Kindle. Just make sure you insert them using the styles in the Word menu at the top of the screen. Create a new style for points based on ‘normal’. Hope that helps! Thanks so much for the great information in this post. I was wondering if you have tips about getting the margins correct when using a Word document (then converting to filtered html) and uploading on Kindle. I have tried several things with my margins but they still display too wide on my Kindle book. I cannot seem to change these in the Word document and make the changes happen in the final Kindle version. Any suggestions?